Last weekend there was a large gathering of deaf people in Las Vegas. Among those there was a Minnesota t-shirt screen printer who bragged about a hot selling t-shirt. That got my attention! I had a few friends that kept an eye on the Las Vegas event for me while I manned our booth at the county fair. This could infringe with one of Chick-fil-A trademarks. 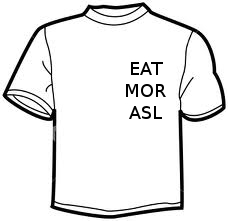 They seem to own the "EAT MOR" part as theyve been picking on those who use it. I assured the folks behind the t-shirt that if theyre bothered by Chick-fil-A, I would put many of their restaurants under my microscope for access violations. I'll have no problems getting dozens of other disability organizations all accross the nation to do the same. Orange County, California has over 600 businesses that have access violations. Not to mention the latest addition to the long list of complaints, last Sunday, a convenience store situated near a soup kitchen has refused entry to a pair of deaf-blind, and blind people because they had their guide dogs with them. I'm still proud of it! It's comical to see that someone thiks the t-shirt is my idea. It belongs to a screen printer in Minnesota. Its up to the t-shirt maker to come up with appropriate legalese to defend their idea to produce the t-shirts. If the Chick-fila company bugs this t-shirt maker, I will promise to bug the Chick-fila company on an entirely different front.